UPDATE: SOLD OUT as of 10:37 Eastern time. If you can't wait for more releases from Beast Saga, Rise of the Beasts, or Battle Beasts, check out the unnecessary-but-why-stop-now fourth line we'll cover here, a bit. The Venjorun Armorvor from Onell Design is live now, and is only $8. 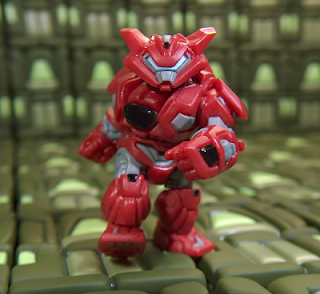 It's not as cheap or as 2-packey as the great Vorin and Zik, but it's incredibly customizable and built on the famous, beloved, and just plain fun Glyos System. This is a unique plug system which basically lets you dismantle and swap figure parts easily. This figure has been in development at Onell Design for a long time now, and the first one is on sale right now, much to my surprise. Order it here for $8, if you see this tomorrow it's probably already sold out. 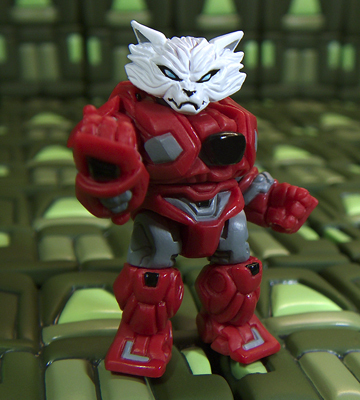 It's an armored wolf figure, and the alternate armored head is a thing of beauty. Historically, figures from this line can sell out in hours, and some in minutes. I ordered 3. I assume others will as well, so if you see this go order one right now. For more on this line, check out an article I did last year on the first public showing of the early prototype. Welcome to my overcrowded blog, Armorvors! 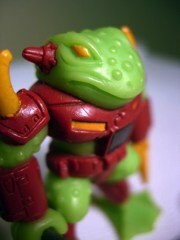 For more on Glyos, check out The Glyos News Dump (16bit.com), TheGodBeast Customs (TheGodBeast.com) Outer Space Men News (16bit.com), Glyos Transmissions Web Blog (Official Onell Design site). Other than Minimates, this is one of the most customizable lines out there today. Takara-Tomy posted an update to their Beast Saga web site which includes a video that demonstrates the game. I think I get the gist of it, the audio quality is terrible, the sound effects are delightfully old school, and of course, it's all in Japanese. I would say it's worth watching. Check it out. Before I got Vorin and Zik in my hands, I thought what we were getting was old molds with new paint-- I was wrong. 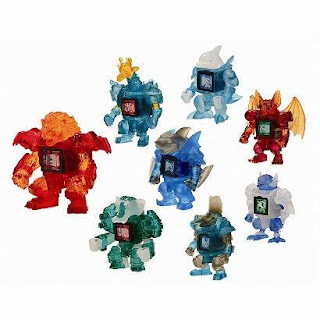 While mostly cobbled together from existing parts, Diamond actually gave Vorin a new torso mold so it isn't the same as the previous 4 one-color promotional versions of the figure. And for this, I am happy. This item was a Diamond Select Toys exclusive, which means it was available to their clients-- so some online stores had these for preorder, and a few other stores at the show had them at their booths. I like this. I'd like to see Hasbro and Mattel do this, mostly because I think it does a bang-up job to discourage scalping and flipping at the show, plus it makes things easier for the rest of us. 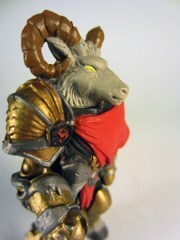 Beast Saga: Clear Figures Coming? 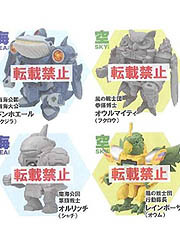 From Yobodashi.com (I've never heard of it either) and via Dragonautes2010, there's a link on clear "blind box chase figures" which, I think, may be partially speculation. The clear characters shown are NOT the figures from the assortment (which may or may not be blind boxed), but rather, are clear versions of the single ones being sold in Japan come September. They may be chase pieces or inserts, they may be inserts in a blind assortment, they may even end up being "lunchtime specials" from the factory. I don't speak Japanese and I can't tell-- but if you have any facts (no speculation please), our comment section is open. As a collector who is very interested in this line, I'll happily track down a convention exclusive or a store exclusive within reason. But rare insert chase figures which may be cherry-picked and/or sold on eBay? I'm gonna pass, thanks. Just give me the painted ones. Today's the big day! 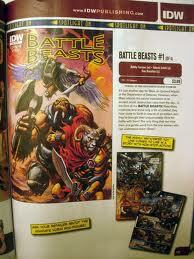 Issue #1 of Battle Beasts should be at a comic shop (or San Diego-based convention) near you. 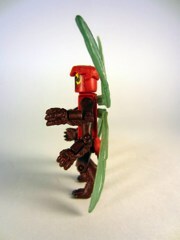 The Stealth Vorin Minimates Figure will be showing up as well... so you if see a spare, please hold one for me. Thank you for your support. If you were in meetings for most of the weekend in San Diego, you may have also unfortunately missed the Comic-Con 2012 Minimates panel. Thankfully, the great folks at Toy Ark captured the whole thing and now you can see all sorts of exciting things. 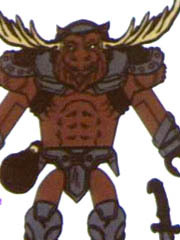 The big takeaway for you guys: Toys R Us will get a Battle Beasts Minimates 2-pack of a moose and a bat, recreating the ongoing struggle that takes place in nature every night. Both sport weapons and look like they're going to be fun and just ugly enough to be awesome. Just a quick update: we added more pictures! 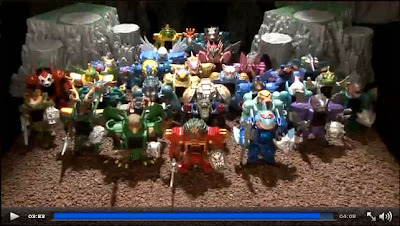 Check out Diamond Select Toys Battle Beasts Minimates coverage at 16bit.com for over a dozen new, clearer, and better pictures of the new toys due out at the end of 2012. 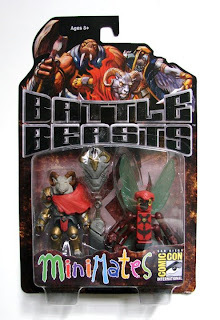 In the interests of cranking out something quickly, check out the 16bit.com Battle Beasts gallery. I got a few quick shots today and will go for more later-- but I wanted to get up something! While I don't know if this is everything, it turns out at least two versions of Vorin were made for Comic-Con 2012 by Diamond Select Toys. A clear blue Vorin showed up at their booth this morning, and I found a golden Vorin in a swag bag from a party held by the Heavy Metal magazine people. More as I have it! I can safely say that the gold one is absolutely beautiful in person, and the blue one looks very nice. (It's dark and late, it might be incredible but I'm in a dark room right now.) Update: Yeah, the blue one is awesome too. Some supremely snazzy Battle Beasts Minimates Packaging has been revealed by Diamond's own Zach Oat at the Minimates Multiverse board. Nice! It's got a monster logo and big character art of the three main characters, plus a big colorful Minimates logo. There have been numerous styles of packaging for the Minimates over the years and I gotta say I'm digging it. Visit their board for more! You'll be able to buy these at Comic-Con in San Diego this week or, failing that, you can order yours online at Entertainment Earth. These new items are slated for November. The previous items are due in September.